Can I add 18 (a)? Blogging and tweeting also make NOT attending events more fun, and provide a little consolation prize, to boot. I'm not able to attend CPRS's Social Media Conference this morning, but have been able to benefit from great insights by following its hashtag at #mcoy2010. Great advice - it's the kind of stuff I read on Copyblogger all the time! If you haven't discovered it already, it's a must read for any serious blogger / web copywriter. I'm a tad surprised that you encourage your students to blog, at least under their real names. One poorly thought-out musing could screw them when applying for jobs, running for office, etc, etc. Not only that, to employers, a prospective employee with a blog would no doubt be viewed as an additional risk due to the blog itself. Additionally, with Google Cache and archive.org nothing is really ever gone from cyberspace. That said, from what I've seen, the RRC students seem to be quite careful. Nonetheless, the risk is there and the blog itself is a liability. The blog is a liability? Oh, anonymous, say it ain't so! This is coming from someone who has been blogging for awhile now, but the CreComm blogging assignment has been, by far, my favourite assignment this year. I love writing about one of my favourite topics in the world, and reading what everyone else has to say. It's great! Great to hear your "experiment" has been a success. I hope it's recieved a good response from your students? I blog under my real name. 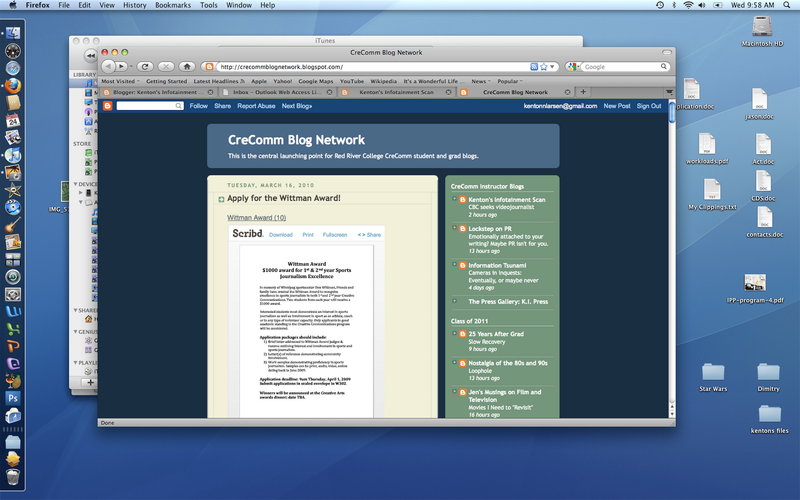 And I also spoke to Creecom students about blogging in general, and that was a subject matter; to go anonymous or not? It's a decision one needs to make and choosing to do so under one's real name is absolutely not a liability. If some employer doesn't want to hire me because of the material on my blog? Guess what, I don't want to work for them. I put my blog on my resume and it comes up as a subject matter in all of my interviews. It is the opposite of a liability: when someone finds out how passionate you are about something or sees how much work you put into something without being paid for it, they are interested, they lend an ear and if anything, there is an acquired skill set with communicating in this fashion. A great post Kenton! Except the parts that make me feel crappy for not maintaining my blog more. Because of my past blogs and several YouTube videos, I can never run for office. But I'm not sure what political party would ever want me in their fold- mostly because of my neurotic speaking skills- so I think I can live with that. The biggest mistake people make when blogging is treating it like a personal journal or pretending you don't have an audience: all it takes is one Google search to find your comments and, if they're interesting/ controversial enough, be read by millions. There's still stuff on Archive.org that I wish I could erase; not because it's incriminating (well, that’s subjective), but because there's a context behind the content that takes too long to explain to people who don’t know me- like those voters I will never get a chance to woo. Bloggers need to treat their content as if it were going into a newspaper that will live forever no matter how many copies you collect, douse in gasoline, and set ablaze. The Internet is far more permanent than any print publication, which is why it scares me when I see how haphazard some are with their choice of words. Hey! I was (but hope I am no longer) one of those haphazard fellows. We’re responsible for the content we create. The medium is just a platform. P.S The extreme-permanency of the Internet is why I believe in the power of Twitter- I can do a lot less damage to my brand with a 140 character leash. Though, even 140 characters can cause me a lot of grief. There is a point to be had in that it depends on the type of blog. Focusing on political and social type issues is a risk, as the more opinions one writes, the chance increases of running afoul of an organization or company's policies or values. It may limit your opportunities. There would be concern with being formally associated with a blog author in terms of 'controlling the message.' Opponents or critics could exploit any discrepancies between the author and affiliated organization. Certainly relevant in the areas of public policy, advocacy, or special interests. There are also blogs which are seemingly histrionic in nature, and many may perceive the author to have created an online shrine to him or herself when Facebook alone wasn't enough to satisfy their attention-seeking impulses. In other words, they would likely be viewed as being an unstable individual. Many times, I have also noted examples where some bloggers (no doubt unknowingly) had crossed the lines of libel. I think that anybody that does blog should spend a good deal of time studying such laws before signing-up for an account, but am assuming that many do not. Additionally, be mindful that our Charter rights of freedoms of opinion and expression should have an asterisk which indicates "void where prohibited by law." In my humble opinion, I think that Anonymous is a safer way to be in the online world, and limit yourself to occasional comments on discussion forums or other people's blogs. Kenton, I do enjoy following your blog, by the way.